Okinawa is a rare tropical paradise that mixes a beach-going culture with a preservation of the past. Try exciting watersport, tan on white-sand beaches, watch whale sharks gliding in an aquarium or visit a castle that once protected the archipelago’s rulers. Okinawa is the main island of the Okinawa Prefecture, an archipelago of 160 islands south of mainland Japan. Its main access point is Naha, a busy urban sprawl that also serves as the region’s capital. Find shopping, food and crowds along Kokusai-Dori, Naha’s main street. While here, taste Okinawan soba, a soup-noodle dish famous to the area. Not far from town, the hilltop Shuri Castle reminds visitors of the island’s ancient history. Take a short drive south from Naha to the Peace Memorial Park, where monuments pay tribute to the quarter of a million American and Japanese civilians and soldiers who died here in World War II. It was one of the Pacific’s most fierce battles. To the north, the Ocean Expo Park gives visitors the chance to learn about the archipelago’s marine life. See whale sharks cruising alongside tropical fish at Okinawa Churaumi Aquarium, home to one of the world’s biggest fish tanks. Nearby attractions such as a re-creation of a 17th-century Okinawan village and a botanical garden boasting more than 2,000 orchids make northern Okinawa a satisfying daytrip destination. The island features miles of popular and less-crowded beaches that are a great to visit throughout summer. The best swimming months are between April and October. Scuba dive amongst rock formations at Mission Beach or enjoy views from the lighthouse at Cape Zanpa. Not far from the coast, walk to the Hiji Waterfall or traverse stunning pineapple fields in Nago Pineapple Park. Follow subterranean streams of photograph stalactites at Gyokusendo Cave. 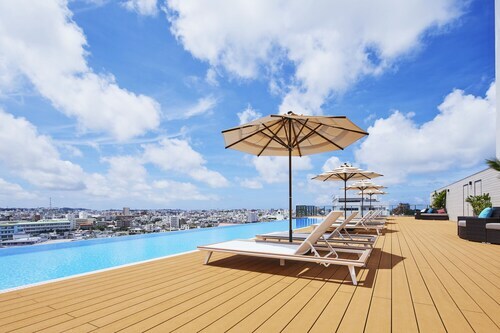 Fly into Reach Okinawa’s Naha Airport from Japan or China. Get around the city by bus. Alternatively, rent a car (or moped) to travel further afield. Tours can be booked through Naha’s travel agencies. Naha’s lively main street is home to an array of superb restaurants, souvenir shops and galleries selling fine glassware. 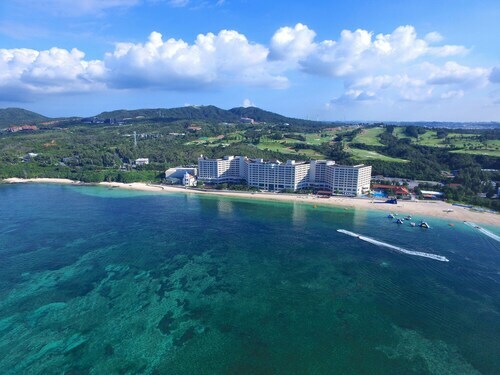 Relax on the pristine sand, discover marine life on a diving trip or ride the waves on a wakeboard at this beautiful privately owned beach on Okinawa’s west coast. Take a tour of this lavishly decorated hilltop castle that was home to powerful Japanese kings for more than 400 years. Marvel at huge whale sharks in one of the world’s largest aquariums at this marine center that recreates the aquatic environment of Okinawa’s waters. Discover one of the most spectacular natural landscapes on Okinawa and get close to deadly snakes at this diverse theme park. 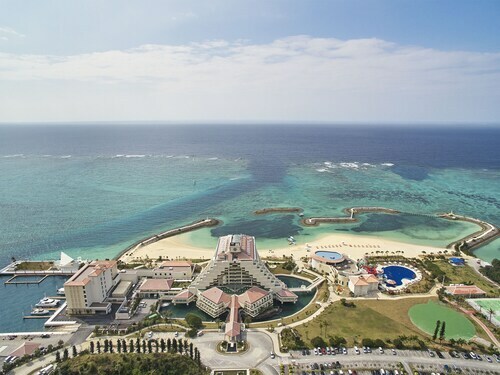 Spend a relaxing day at the seaside on gorgeous Okinawa Beach, complete with a shipwreck playground, several picnic pavilions, a safe swimming zone and quiet walking trails. Dip your toes in aquamarine-colored tide pools and swim in the tropical waters that lap this gorgeous white-sand beach fronting Itoman City. Experience the wide array of family-friendly activities on one of Ocean Expo Park’s best beaches, which has three separate areas and an aquarium to explore. Wander around the greenhouses and experience the delicate aroma and otherworldly beauty of orchids and other tropical flowers in this dreamlike garden. Stroll along this wide arc of fine white sand, go swimming in the gentle waters and look out toward the aquamarine ocean waters at this pretty beach. Peer between the tendril-like vines that hang down from the forest canopy and explore ancient limestone caves in this mystical attraction in Nanjo. More than just a rest stop for visitors exploring Yambaru, this landmark roadside visitor center has a market selling fresh local produce and freshly made meals. Situated near the boardwalk, this hotel is within a 10-minute walk of Ocean Expo Memorial Park and Motobu Genki Village. Okinawa Churaumi Aquarium and Emerald Beach are also within 2 mi (3 km). 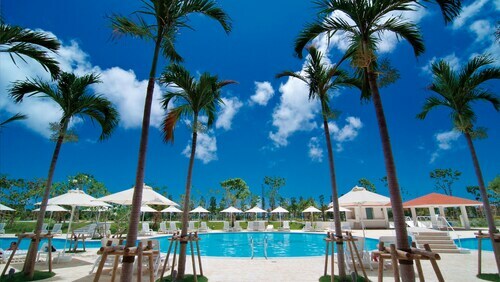 Nestled on the beach, this Onna resort is within 3 mi (5 km) of Tiger Beach and Nakadomari Site. Iha Castle Ruins and Bios no Oka Nature Park are also within 6 mi (10 km). Located in Matsugawa, this hotel is within 1 mi (2 km) of Ryutan Site, Shurijo Castle, and Kokusai Dori. DFS Galleria Okinawa and Naminoue Beach are also within 3 mi (5 km). Shiritsubyoinmae Station is 16 minutes by foot and Omoromachi Station is 18 minutes. This family-friendly Nago hotel is located near the beach, 1 mi (1.6 km) from Busena Marine Park, and within 9 mi (15 km) of Mission Beach and Nago City Hall. Cape Manza and Neo Park are also within 9 mi (15 km). 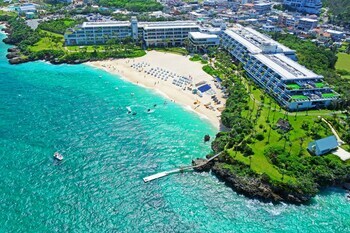 Located in Fuchaku, this beachfront hotel is on the boardwalk and within 1 mi (2 km) of Tiger Beach and PGM Golf Resort Okinawa. Nakadomari Site is 2.4 mi (3.9 km) away. 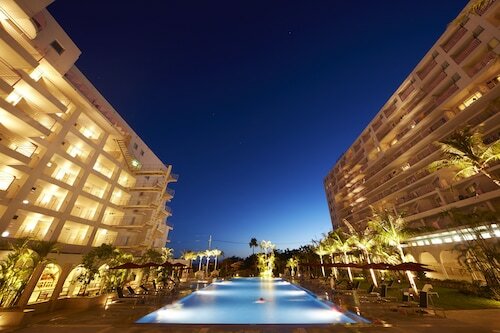 Offering direct access to the beach, this Itoman resort is within 3 mi (5 km) of Bibi Beach, Okinawa Outlet Mall Ashibinaa, and Toyosaki Chura Sun Beach. Ryukyu Glass Graft and Umikaji Terrace Senagajima are also within 6 mi (10 km). This family-friendly Chatan hotel is located on the waterfront, within a 10-minute walk of Mihama American Village and Sunset Beach. Kadena Air Base is 3.1 mi (5 km) away. 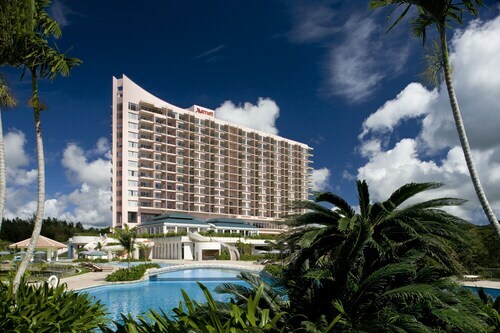 Situated near the beach, this hotel is steps from Ocean Expo Memorial Park and Okinawa Churaumi Aquarium. Tropical Dream Center and Native Okinawan Village and Omoro Arboretum are also within 10 minutes.